I read this article and found it very interesting, thought it might be something for you. The article is called Roe & Collective creative workshop and is located at https://www.totallydublin.ie/arts-culture/roe-collective-creative-workshop/. Celebrating reinvention with Roe & Co Irish whiskey through a creative workshop series. Roe & Co, a brand that lives and breathes creative reinvention, will bring some of Ireland’s most impressive artists and creatives together to celebrate craft in the heart of Dublin city. 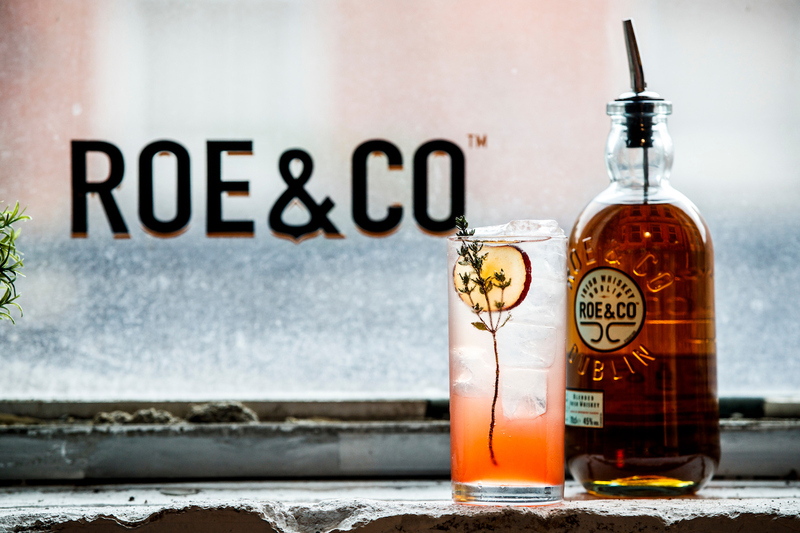 A yet unused space within the newly revived Dollard Printing House on Dublin’s Quays has been transformed into a Roe & Co venue, where the premium Irish whiskey will host this workshop, as part of The Roe & Collective. Taking place just a stone’s throw from the new Roe & Co distillery on James’s Street which is due to open its doors in Spring 2019. This Saturday (December 8) Roe & Co will host a series of creative workshops in Dollard & Co. There will be a cocktail masterclass with Alan Mulvihill, an art of the portrait masterclass with wet plate photographer, Alex Sapienza and a copper etching live demo with artist, Helen O’Higgins. Wood fired pizzas will be served from Roberta’s Restaurant, and guests will choose between three serves created by Roe & Co. while they enjoy the experiences of the afternoon. When all is wrapped up, guests are invited one floor down to continue the fun in Roberta’s, with every ticket holder getting a complimentary Roe & Co. serve. The ‘crafternoon’ is set to be the perfect setting for a meet-up with friends with an artistic twist. So, put the phones away and get together for an afternoon of creativity, craftmanship and to learn new skills. The event is from 3pm to 6.30pm and tickets are €25 available here. Totally Dublin spoke to some of the participants. 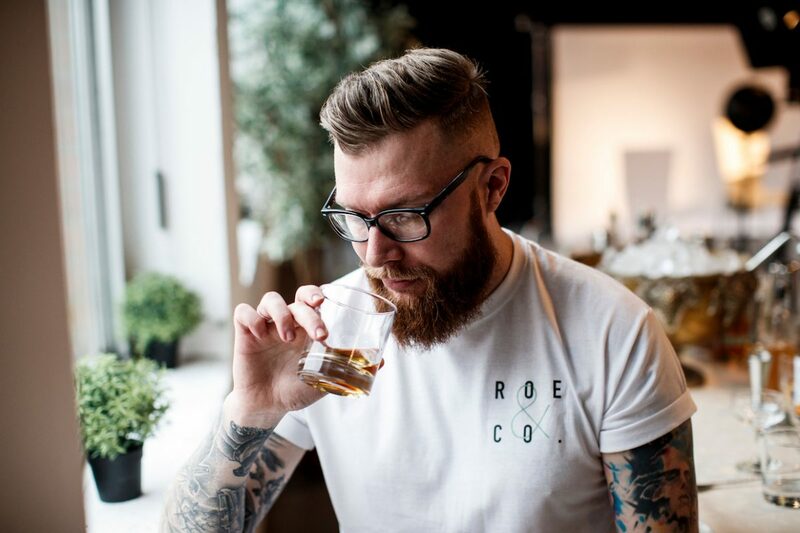 Roe & Co’s brand ambassador will host a completely unique cocktail masterclass which is sparked from reinventing the ordinary. Alan will bring guests on a step-by-step journey to create two delicious Roe & Co cocktails. Can you explain what the Roe & Co Collective is and what it aims to achieve? For me, the Roe & Co Collective is about a bringing together of likeminded folk who want to explore something a little different. Whether it’s testing the waters of drinking whiskey for the first time after a lifetime of gin & tonics or looking down the lens of Alex Sapienza’s incredible camera and, due to the insane clarity of his equipment and the quality of his craft, putting every pore and piece of yourself on display. It’s something new, it can be challenging at times but also keenly rewarding. Bringing home a piece of work created by your own hand but guided by an experienced one like Helen’s is an amazing treat and every time I see her in action I wish I had one tenth of her artistic ability. What can people expect at the workshops on December 8? Who is it for? The event is for everyone. Anyone who expresses an interest in the revitalisation of older crafts will be fascinated by the attention to detail and commitment to their trade of Alex and Helen. It’s such a pleasure to be able to support these events with our whiskey be it through a cocktail masterclass with myself or by simply bringing a room of creative people together to share a drink and a great time. The growing appreciation of ‘craft’ in recent years is evidenced across so many walks of life. What inherently excites you about the fusion and/or development of craft within your discipline? Are you noticing any trends? The drinks industry is an ever-rotating door of trends, and both globally and at home Irish Whiskey is really punching hard. From near destruction and ruin in the mid-1900s we are set to enjoy the biggest ever sales of our beloved, national spirit in 2020, surpassing the ‘glory days’ of the pre-prohibition era in the States, obviously a massively important market for Irish whiskey. I love the way the trend is leaning for many reasons, it means that the general consumer’s knowledge is on the up and up and people are more inclined to ask about where the product comes from and why we do it like we do rather than simply tarring every category with the one brush, so to speak. People are looking at drinks like they look at food nowadays – investing in a better experience than simply getting base nutritional values. How important is environment – namely the space within Dollard & Co in this instance – in the hosting and amplification of this event? Taking on the empty space at Dollard & Co and transforming it into a room that suits the needs of all three of us was no mean feat and it took a serious pulling together of the crew from Dollard, the guys at WH and Catapult design to get us where we are. A dark room, a cocktail bar and a copper etching studio isn’t exactly an easy brief for anyone, but I know when people get in there they will be blown away by the atmosphere we have created. Great people, great craft and good music, what more could you want? Reflecting on 2018 and looking forward to 2019, what achievements are you most proud? What excited you most from a cultural experience/perspective and what do you hope to accomplish? The obvious one for us at Roe is the distillery, we’ve made huge strides in the last few months towards breathing life into our new home, the old Guinness Power Station on Thomas Street, and it is something we are all enormously proud of. 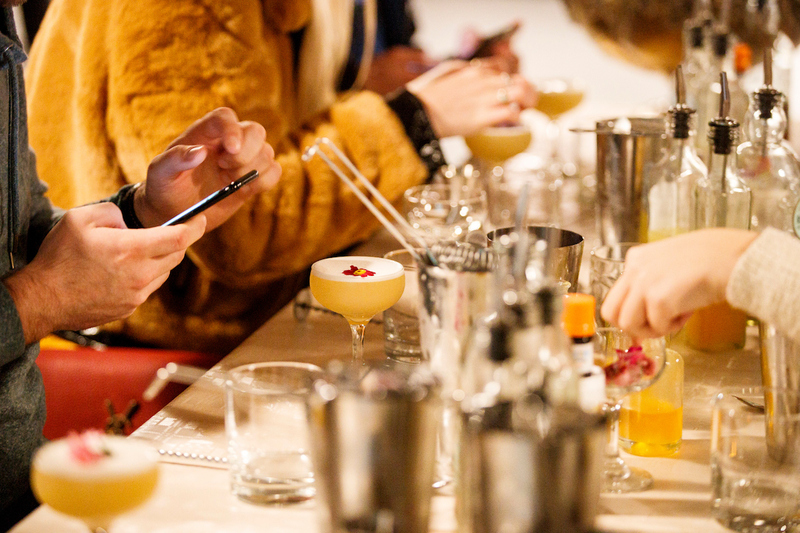 From having Drinksology on board to help us with the bar’s design, they also helped with Dead Rabbit Bar and Blacktail Bar in NYC, to the remarkable engineers who facilitate the madness of our design requests on a daily basis. I truly believe it is going to bring a whole new experience to an already thriving Dublin area and aid in the rebirth of Dublin once again becoming a distilling powerhouse. Helen will take guests through the art of copper etching and printing. Helen’s work is an exploration of the architecture, culture, history and everyday life in Dublin City. She will demonstrate the artform and invite guests to try their hand at etching and printing on copper paper. The Roe & Collective brings together artists and creatives in Dublin for a relaxed day of hands-on workshops and delicious cocktails. It spotlights the creativity happening throughout a city with a long and inspiring history and encourages others to get involved and awaken their imagination. In my copper etching workshop, I will demonstrate parts of the etching process and guests will gain some insight into the obscure art form. 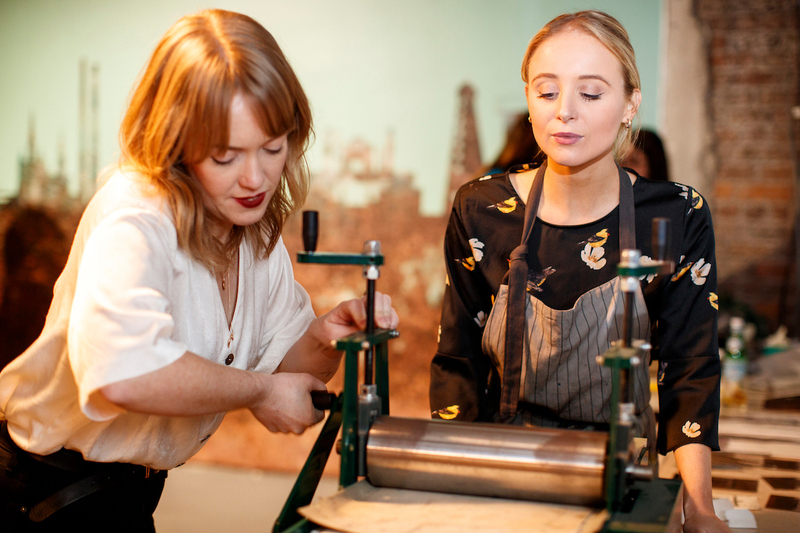 Each guest will then be invited to try their hand at drypoint etching on copper and printing their work using traditional printmaking techniques. Every time one of my prints is revealed through the printing press, it feels like a little bit of magic and I hope to give guests the opportunity to experience this too. Copper etching has been around since at least the Middle Ages. It was used to decorate armour before being developed into a printmaking technique in the late 15th century. I love the tactile nature of printmaking and understanding and actually seeing the science happen during the making of an etching. I love etching’s old history and how the same materials and processes can still be used today. From an illustration perspective, I find the development of technology for artists really exciting. Digital drawing tablets have become so sophisticated in recent years and I’m really looking forward to seeing what possibilities these advancements create within my own practice and how they can be combined with printmaking techniques in new ways. I’m lucky to be a member of Black Church Print Studio in Temple Bar where we have the facilities and support to practice some of the oldest types of printmaking as well as its most up-to-date forms. The space within Dollard & Co is a fantastic environment for the event. The surrounding area is deeply involved with all kinds of exciting creativity, from art to music to literature to theatre — its the heart of creative Dublin. For me, the space feels particularly meaningful as it was once the home of one of Ireland’s oldest print works. Much of my work is inspired by the city, so the views looking down into Temple Bar’s cobbled streets and beautiful red brick architecture which give Dublin so much of its distinct character are the perfect setting. This year I had my first solo exhibition with Hang Tough Gallery; it was a brilliant experience and I learned so much from it and I can’t wait to make new work for another show and try some new mediums. It’s been great to see the growing appreciation for Irish art and design over the last year or two and I’ve really enjoyed the projects I’ve worked on as a result of this and I’m excited for to what’s to come. I will finish a two-year diploma in Graphic Design this May and I look forward to seeing what opportunities this presents for me. The third workshop will be with wet plate photographer, Alex Sapienza. Enjoy a masterclass on the art of wet plate photography – a process of extreme light exposure that results in amazing raw style photographs being developed onto a sheet of metal. Alex will lead an hour-long workshop where he discusses this art form, how the process is done and why the reinvention of this art form has excited him.